The three-track, 40-minute "Widowmaker," the critically acclaimed new album by UK-based extreme metal act DRAGGED INTO SUNLIGHT, is now available for purchase! You can pick up a copy of the album on CD from the PROSTHETIC webstore HERE or digitally through Amazon MP3 or iTunes. "Widowmaker" is also available for pre-order on 12" vinyl format in white, 180-gram black or clear vinyl with green splatter. The release of the LP, originally set for Nov. 13, has been pushed back to Dec. 18 due to manufacturing delays, but pre-orders are still expected to begin shipping in late November. Hailed as a "crushing musical experience easily among the year's best extreme-metal records" by Revolver, "Widowmaker" was named "album of the month" in the new issue of Terrorizer. The album also garnered 4/5 ratings from Alternative Press -- who claimed "music doesn't get much more devastating than this" -- as well MSN Entertainment (who also awarded it "Album of the Week"). 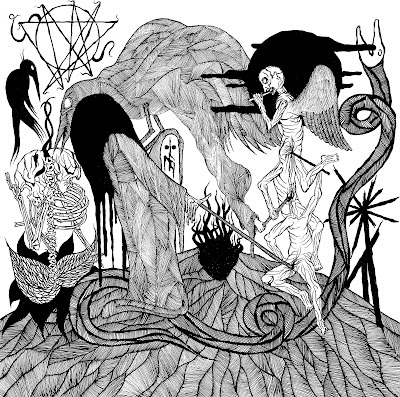 The members of DRAGGED INTO SUNLIGHT -- whose identities remain hidden by masks, and who perform live with their backs to audiences in near total darkness -- have claimed that the concept behind "Widowmaker" is "everything heavier and everything louder than everything else," and that the album will “leave the listener thinking whether jumping out of a 4th floor window might actually be the best idea they’ve ever had.” It marks the group's first release since 2010's "Hatred For Mankind," which Prosthetic reissued worldwide in 2011. For more information on the band, please visit draggedintosunlight.co.uk. Don't forget to grab your copy of "Widowmaker" today!